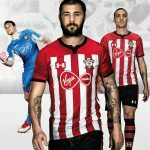 These are the new Southampton tops 17/18, Saints FC’s new home and alternate kits for the upcoming Premier League season. 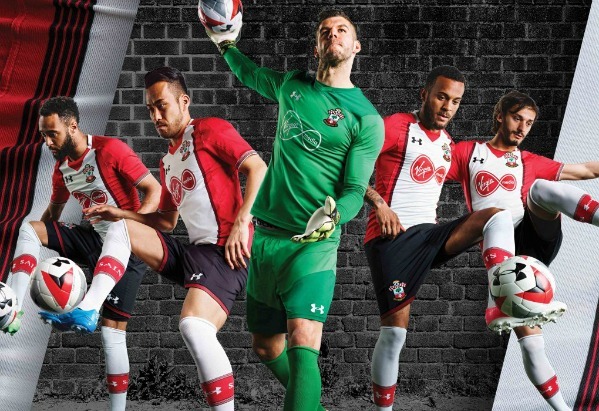 Made by Under Armour, the new Southampton 2017/18 strips were officially unveiled on the club on 17 June, 2017. In the buildup to the reveal, the club released an animated cartoon series, featuring subtle digs at the likes of Ronald Koeman, Liverpool and Portsmouth. 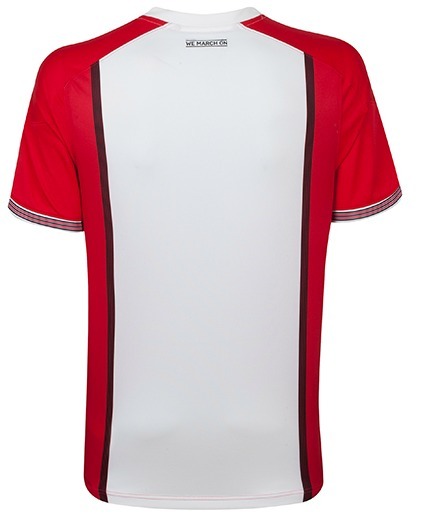 The new home kit takes inspiration from the Southampton shirts of the early 80’s, worn by the likes of Kevin Keegan and Mick Channon, and features a single vertical white stripe on the front and the back. Black shorts with red trim and white socks with a red band complete the look of the new Saints home strip. 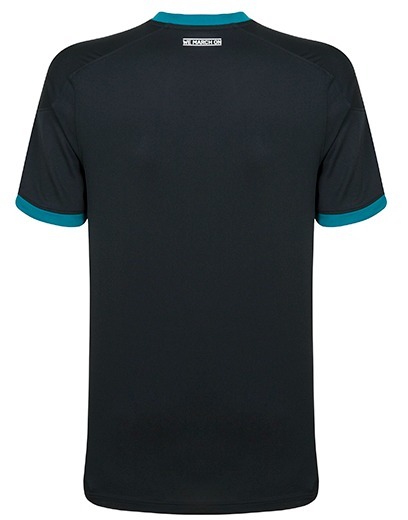 The club’s stripes are seen on the away kit, which is a teal and black creation from the UA stable. On the back of both jerseys is the message “We March On”. 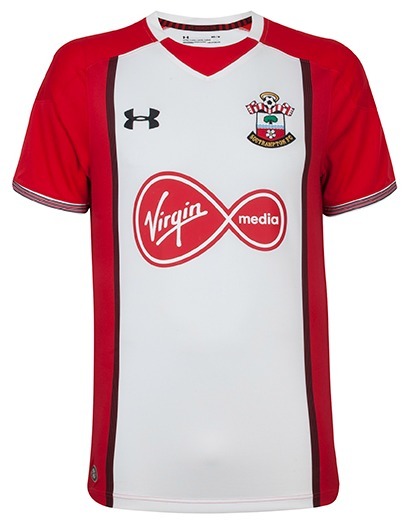 Virgin Media are principal sponsors of both Saints FC shirts, as can be seen in the pics below. 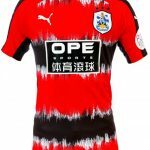 This entry was posted in English Premier League and tagged Under Armour on June 17, 2017 by Football Kit News. I love them both. Don’t know whether the Saints fans will. The fans love this too, as it’s what Saints wore in their most successful period in the early 80s. 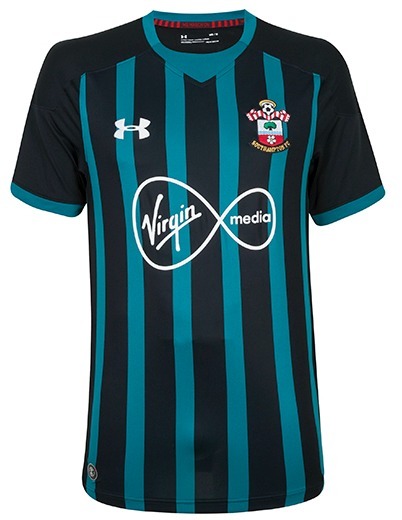 I really like the colours of the second kit, but once again their kit designers seem to have forgotten that they’re in the same league as Bournemouth. Emergency third kit imminent. i cant believe that i actually love the design..its kinda unic and different in a good looking way..
A nice shirt! Other kit manufactures should really have a good look here as its not rocket science in terms of a good sale! A fine example of “Retro” at its very best here steeping into an era that all saints fans will remember well and maybe other football fans with mixed nostalgia will too!